18kt white and yellow gold golden beryl ring. 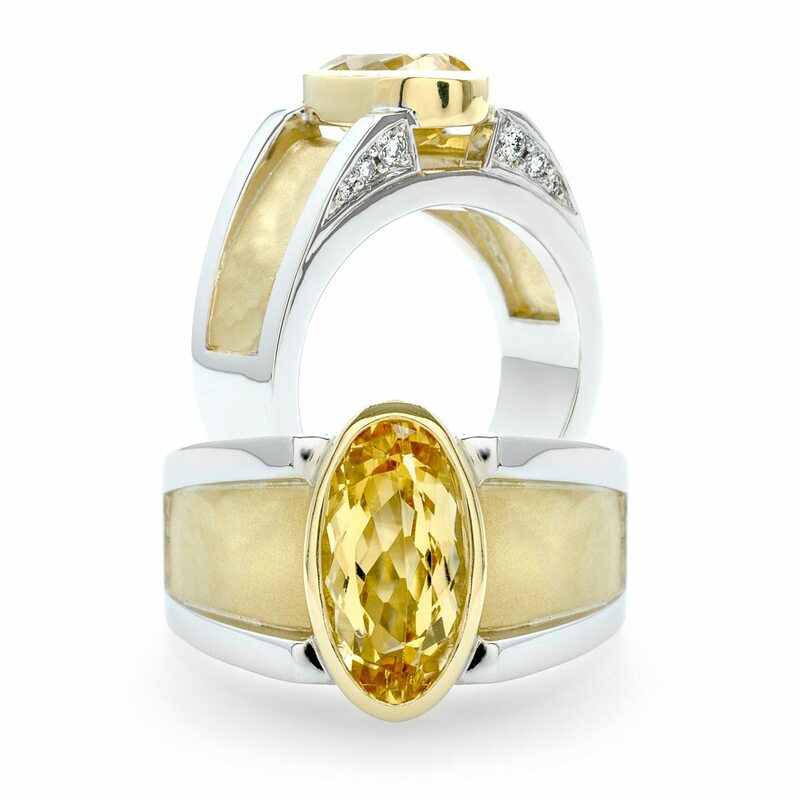 The center oval golden beryl is 2.88ct, and the accent diamonds have a total weight of 0.18ct. Custom made by J.M. Edwards. 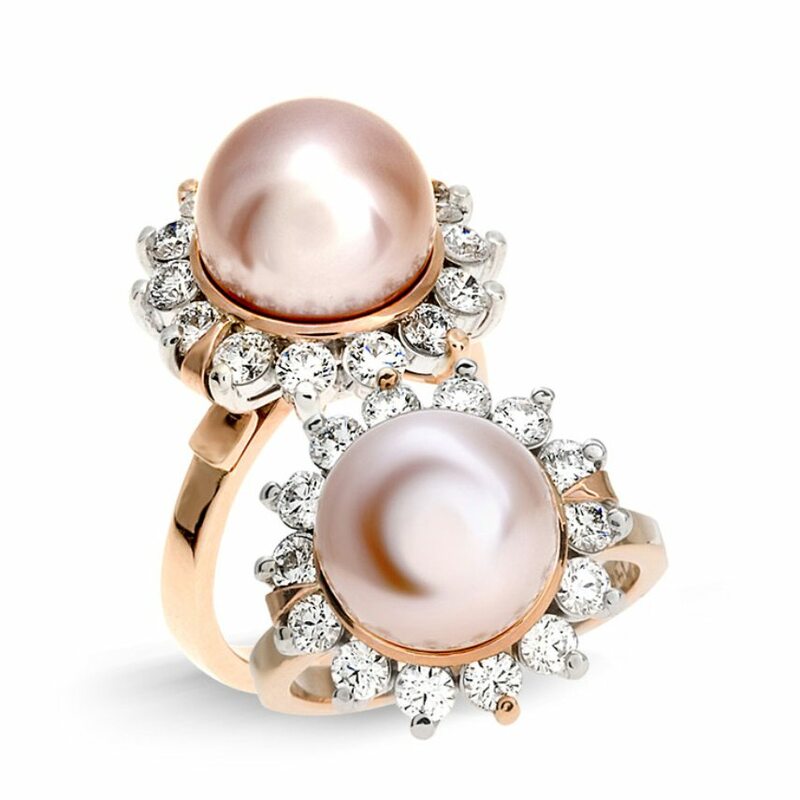 14kt rose gold lavender pearl and diamond ring. The center pearl is 10.5mm in diameter, and the surrounding diamonds are 0.95ct total weight. 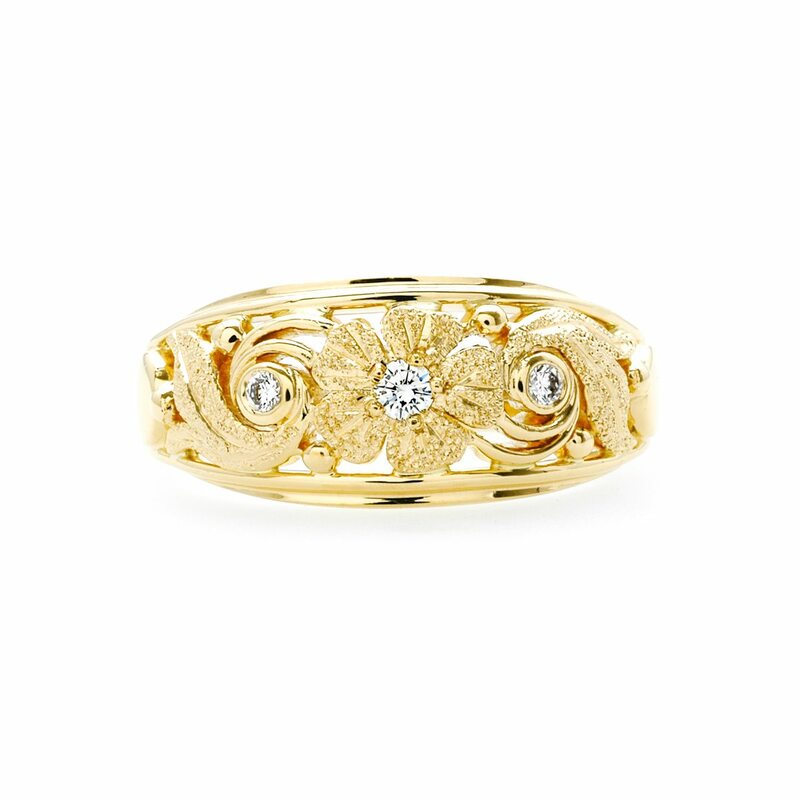 18kt yellow gold floral diamond band. The diamonds have a total weight of 0.08ct. 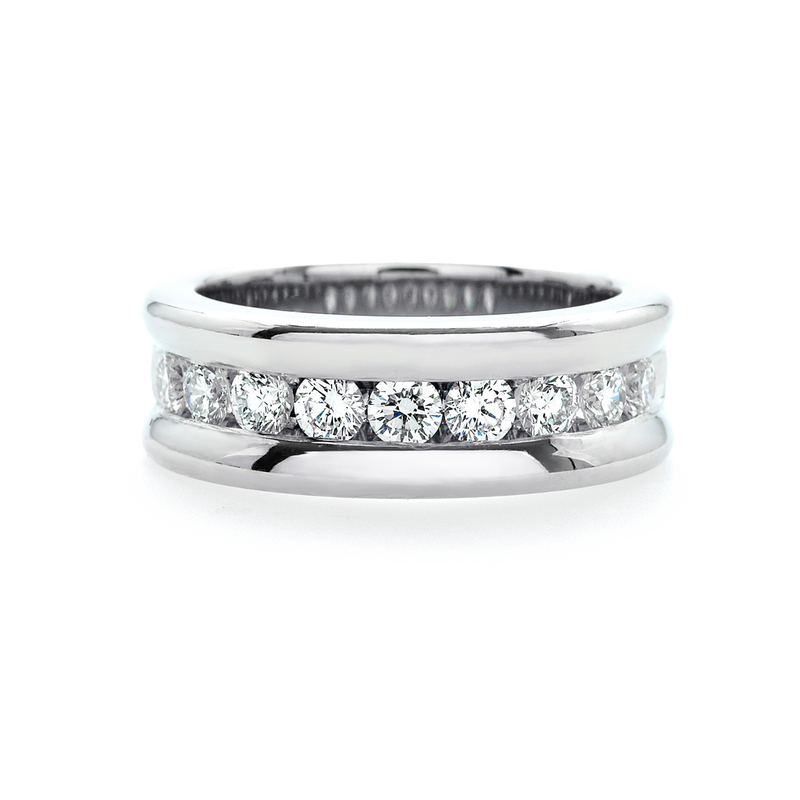 Platinum channel set diamond band. The ideal cut round brilliant diamonds are 0.81ct total weight, E-F in color and VS1 in clarity. 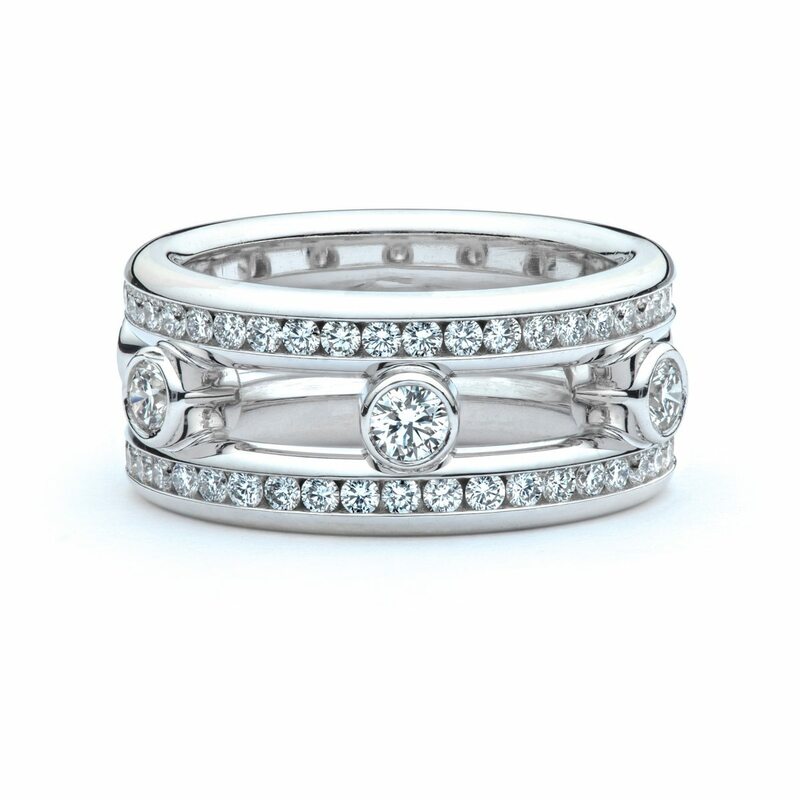 18kt white gold diamond band. The 88 round brilliant diamonds have a total weight of 1.89ct, and are G in color and VS1-2 in clarity. 18kt yellow and white gold Edwardian style diamond ring. The diamonds have a total weight of 1.01ct and are G-H color and VS2-SI1 clarity. 14kt rose and white gold ring. This ring features 0.11ct total weight of diamond accents. Colorless ideal cut diamonds set in hand fabricated 18kt white gold are certain to steal her heart with it’s dazzling display of light. Custom made by J.M. Edwards Jewelry. 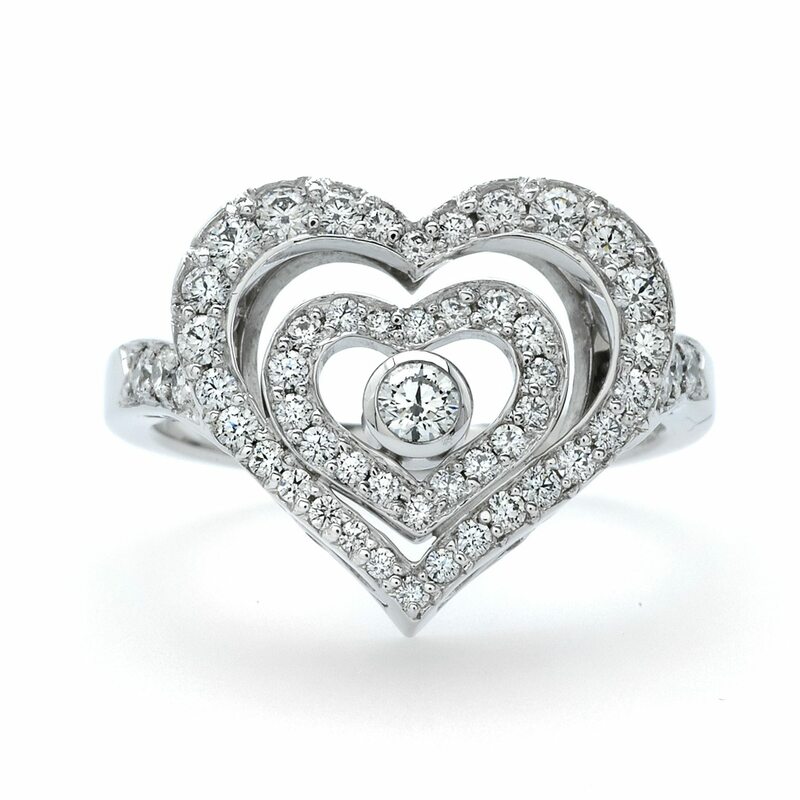 18kt white gold diamond ring. 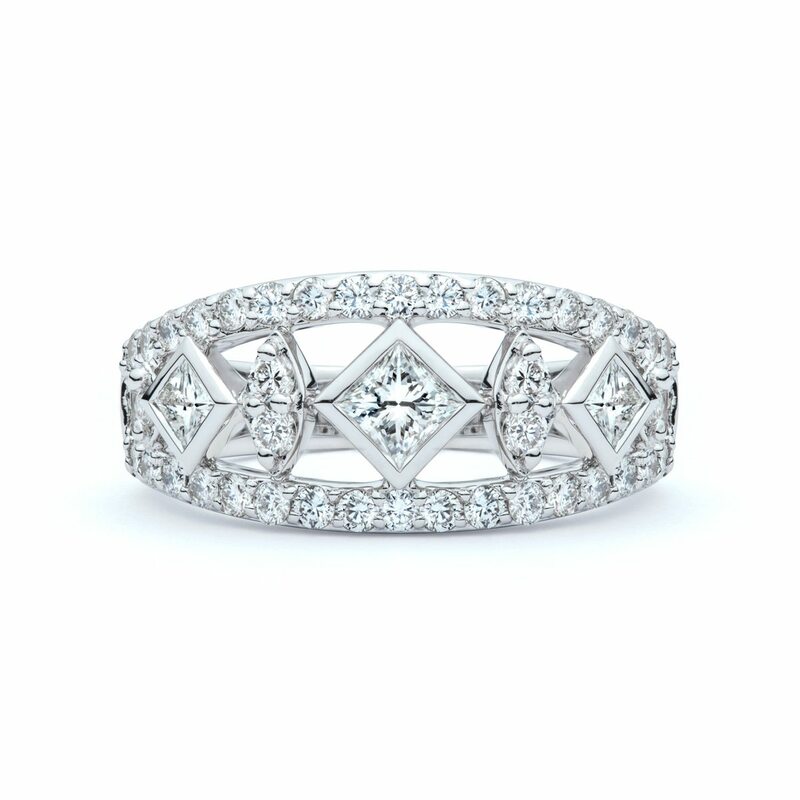 The round brilliant diamond have a total weight of 0.80ct and the princess cut diamonds have a total weight of 0.62ct. 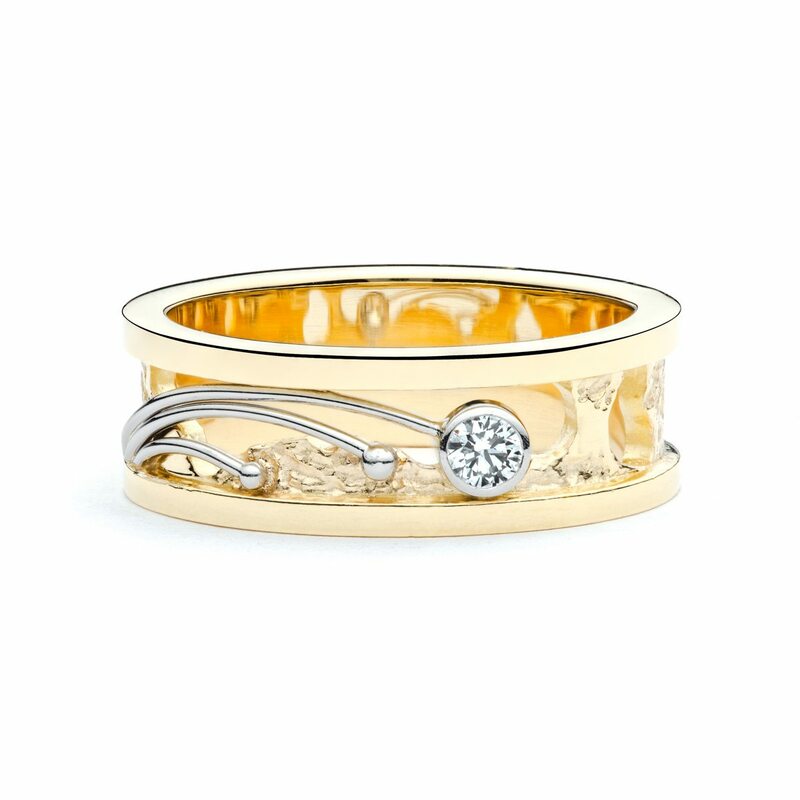 18kt white gold fancy yellow diamond band. The princess cut fancy yellow diamonds have a total weight of 0.77ct, and the colorless diamonds have a total weight of 0.28ct. 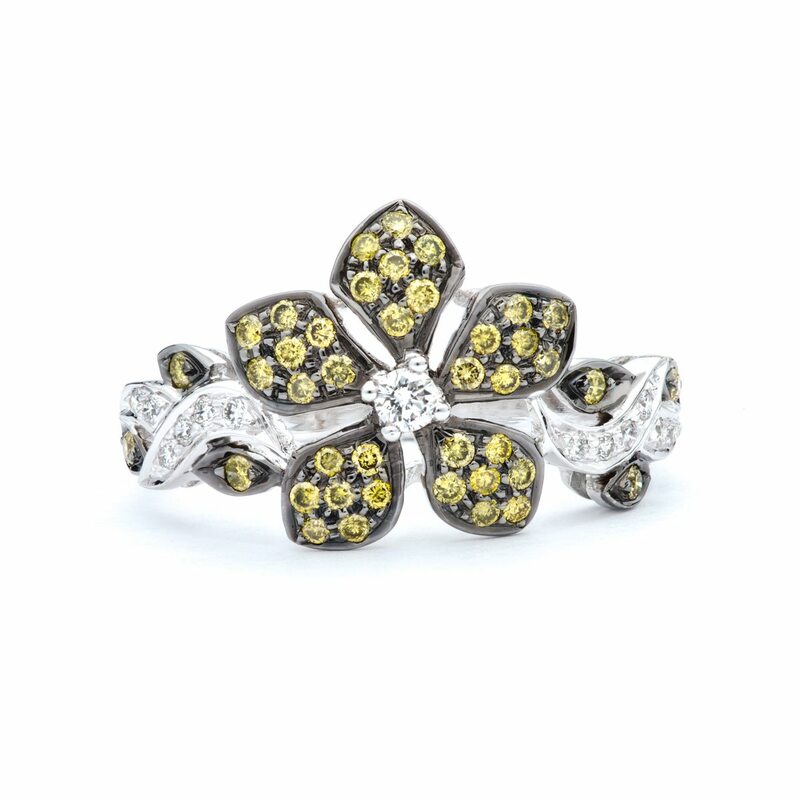 18ky white gold with black rhodium green diamond flower ring. The green and colorless diamonds have a total weight of 0.45ct. Designed and created by Sethi Couture. 18kt yellow gold and platinum hand made shooting star diamond band. The diamond shooting star is 0.11ct, F color and VS1 clarity. Custom made by J.M. Edwards Jewelry. Platinum and 14kt rose gold cognac diamond ring. The center diamond is 1.04ct, and the surrounding ideal cut diamonds are 0.35ct total weight, E-F in color and VS1 in clarity. 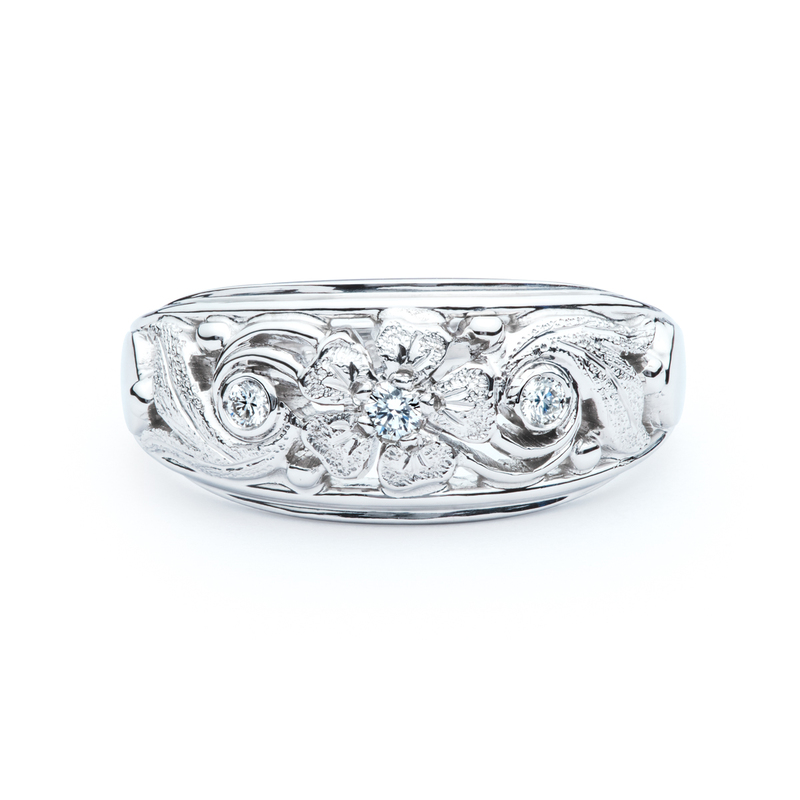 18kt white gold Etruscan Diamond Band. 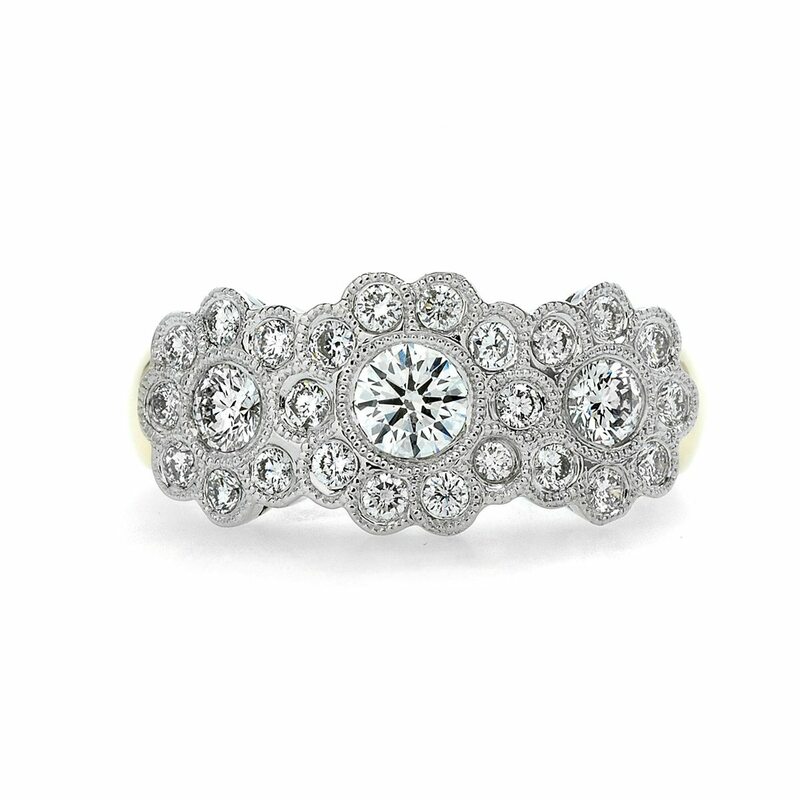 18kt white gold diamond cluster ring. The round brilliant diamonds have a total weight of 1.36ct and are G in color, VS2 in clarity. 18kt yellow gold ruby and diamond ring. The center ruby is 1.18ct and the surrounding diamonds are 0.39ct total weight G color and VS1 clarity. 18kt yellow gold and platinum ruby and diamond ring. The center round ruby is 1.18ct, and the side diamonds are 0.44ct total weight, G color and VS1 clarity. Platinum and 18kt yellow gold green tourmaline ring. The oval tourmaline is 3.10ct, and is accented by 0.44ct of diamonds that are G/VS2. 18kt yellow gold green tourmaline ring. 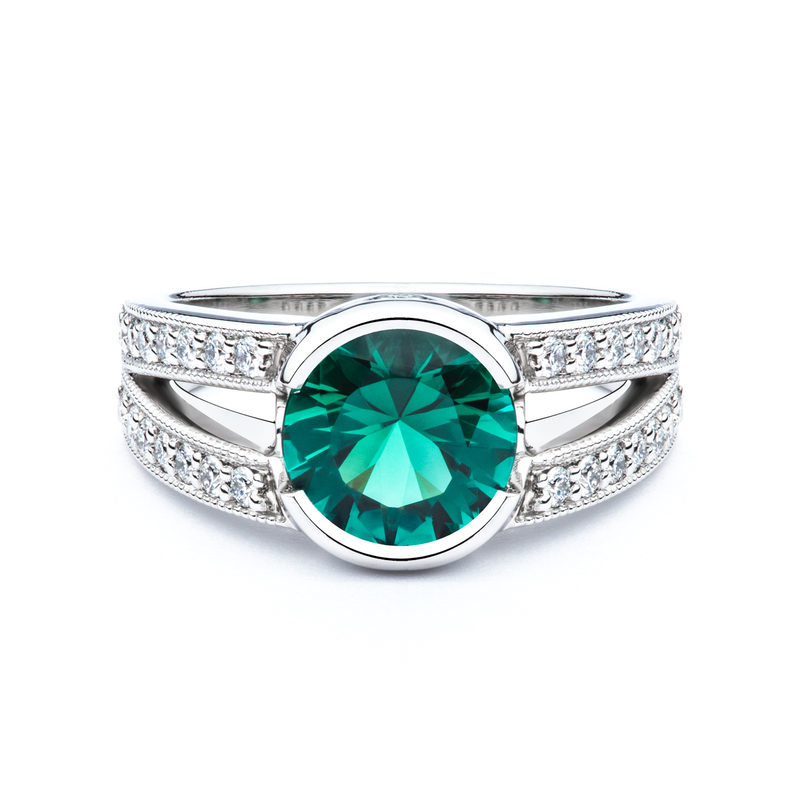 The bezel set round green tourmaline is 3.01ct. 18kt yellow gold and platinum peridot ring. The center peridot weighs 5.67ct. 0.19ct of round brilliant diamonds accent the ring shank, and two bezel set pink tourmalines complete the ring. 18kt yellow gold emerald and diamond Etruscan band. The emerald is 0.35ct and the diamond accents are 0.14ct total weight. 18kt yellow gold and platinum amethyst ring. The center oval amethyst is 1.11ct, and the accent diamonds have a total weight of 0.13ct. 18kt yellow gold tsavorite garnet and diamond ring. The center tsavorite garnet is 0.69ct and the two round brilliant diamonds have a total weight of 0.10ct. 18kt yellow gold and platinum ruby and diamond ring. The center oval ruby is 1.07ct and the two side diamonds are 0.77ct and H/VS2. 18kt white gold sapphire and diamond ring. The center heart shaped sapphire is 1.65ct. The surrounding round brilliant diamonds are 0.36ct total weight, E-F in color and VS1 in clarity. 18kt white gold sapphire and diamond ring. The center oval blue sapphire is 3.29ct, and the surrounding round brilliant diamonds are 1.31ct total weight. 18kt yellow gold Half Pipe pink tourmaline ring. The center oval pink tourmaline is 1.36ct and the surrounding accent diamonds are 0.05ct total weight. Custom made by J.M. Edwards Jewelry. 14kt white gold oval sapphire and diamond ring. This elegant ring features a 1.40ct oval sapphire surrounded by 0.33ctw of E-F/VS1 ideal cut diamonds. Die struck 14kt white gold aquamarine and diamond ring. The center oval aquamarine is 1.70ct. The surrounding diamonds are 0.34ct total weight and F-G color, and SI1 clarity. Traditional elegance. 18kt white gold sapphire and diamond ring. The round brilliant diamonds have a total weight of 0.84ct, and the princess cut sapphires are 0.65ct total weight. 18kt white gold sapphire and diamond pavé ring. The round brilliant diamonds have a total weight of 1.30ct, and the sapphires are 4.85ct total weight. The Ester ruby and diamond ring is hand fabricated in platinum and 18kt yellow gold. 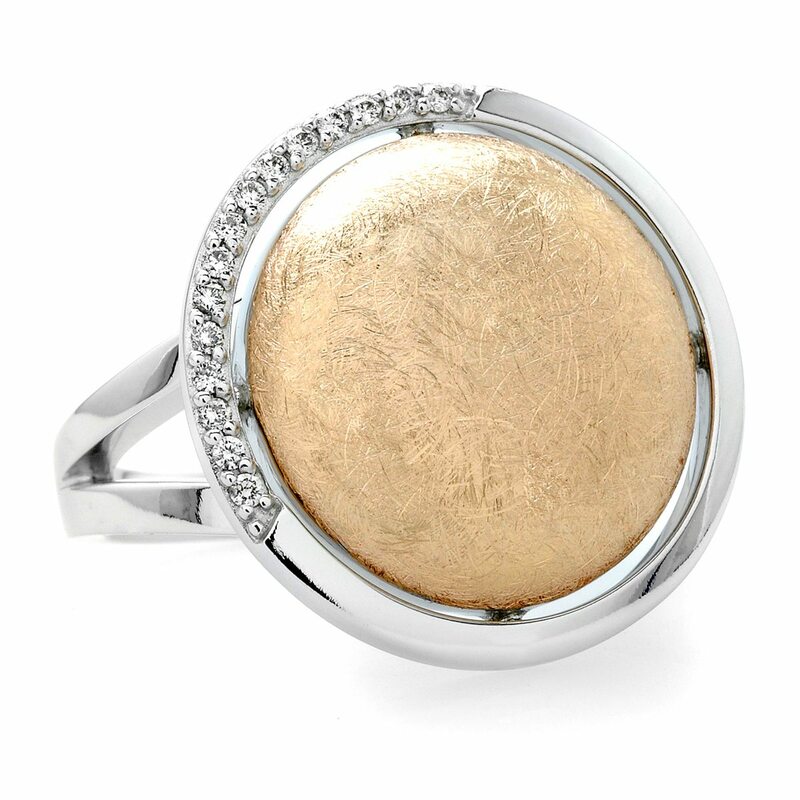 Each piece is hand engraved to match the intricate nature of the ring. Platinum hand fabricated sapphire and diamond ester ring. The bead set round brilliant diamonds are accented by delicate hand engraving throughout the entire ring. 14kt white gold blue topaz and diamond ring. The round brilliant diamond halo has a total weight of 0.22ct and are F-G in color and SI1-2 in clarity. 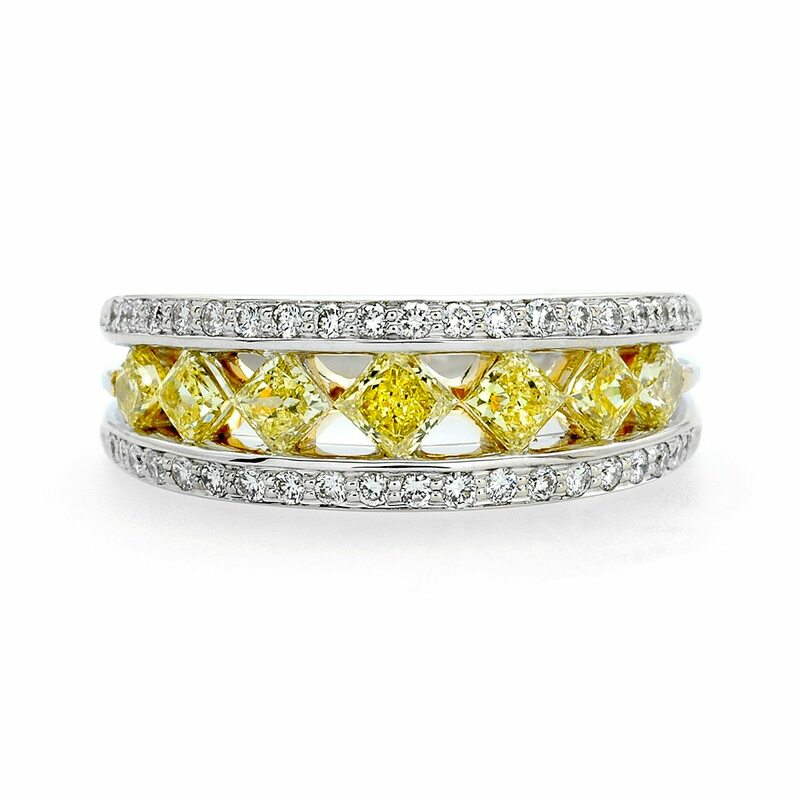 18kt white gold blue zircon and colorless diamond ring featuring fancy intense yellow diamond accents. Custom made by J.M. Edwards Jewelry. 14kt white and yellow gold Half Pipe green tourmaline ring. Hand made in house. Custom made by J.M. Edwards Jewelry. Platinum and 18kt yellow gold padparadscha sapphire and diamond ring. Rose gold onyx and diamond ring. 18kt yellow gold blue rose cut agate and diamond ring. Rose and white gold pink sapphire and diamond bypass butterfly ring. 18kt yellow gold Peruvian opal center stone, surrounded by a pavé diamond and pink sapphire halo. 18kt white gold Peruvian opal center stone is surrounded by a pavé diamond halo of both black and colorless stones. These stones are also flush set down thank. Platinum and 18kt yellow gold emerald and diamond ring. 14kt yellow gold La Rosette diamond ring. The center rose cut brown diamond is surrounded by a colorless diamond halo set in 14kt white gold.